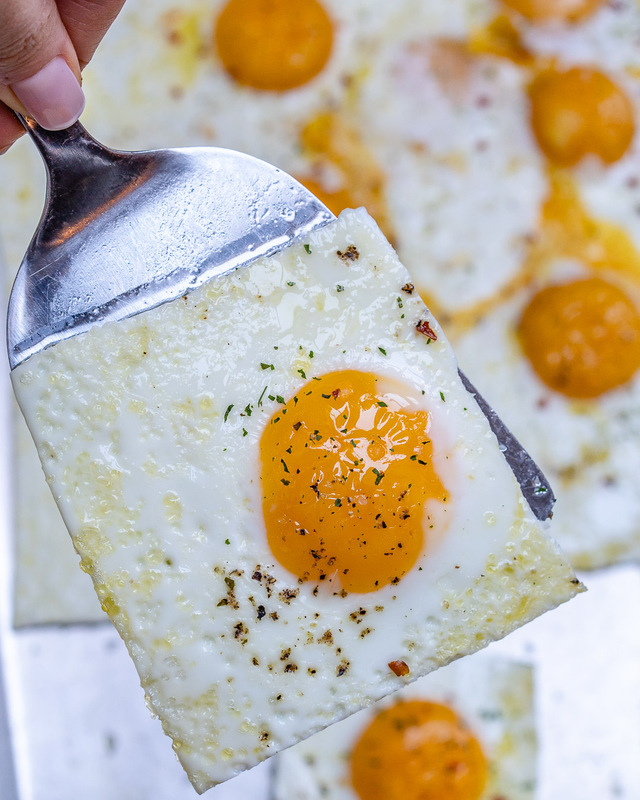 These Quick + Easy Sheet Pan Eggs Will Serve A Crowd! So, you may know that I have a very large blended family…4 kids of my own, 2 more are Jason’s. All SIX are teenagers and they often have friends over for sleepovers on the weekends. Welp. That’s A LOT of people to cook breakfast for! Sometimes 10-12 people on a Saturday or Sunday morning! I recently learned about cooking eggs THIS way, and since perfected my technique (with lots of practice, thanks to my Guinea pig children 😂)! I set out 8-10 slices of nitrate-free Canadian bacon on another, separate, greased sheet pan + sliced Ezekiel English muffins sliced in half on another large sheet pan. Basically, I’ve figured out how to cook 8-10 Egg Muffins using all 3 of the racks in my oven all at once! I add the Canadian bacon + sliced English muffins during the last 5 minutes of the eggs cooking time. Optional: garnish with spices of choice like chili flakes, dried oregano, parsley etc. Preheat an 11×17 inch rimmed baking sheet in your oven at 425 degrees f.
Yes. You really preheated the pan too. Meanwhile very gently crack your eggs into a large measure cup. Once your oven + pan is hot and reaches 425, carefully remove pan from your hot oven (using proper hot pads) and carefully drizzle pan with oil. Coat well. Gently pour in the eggs and spread them out onto your hot pan. 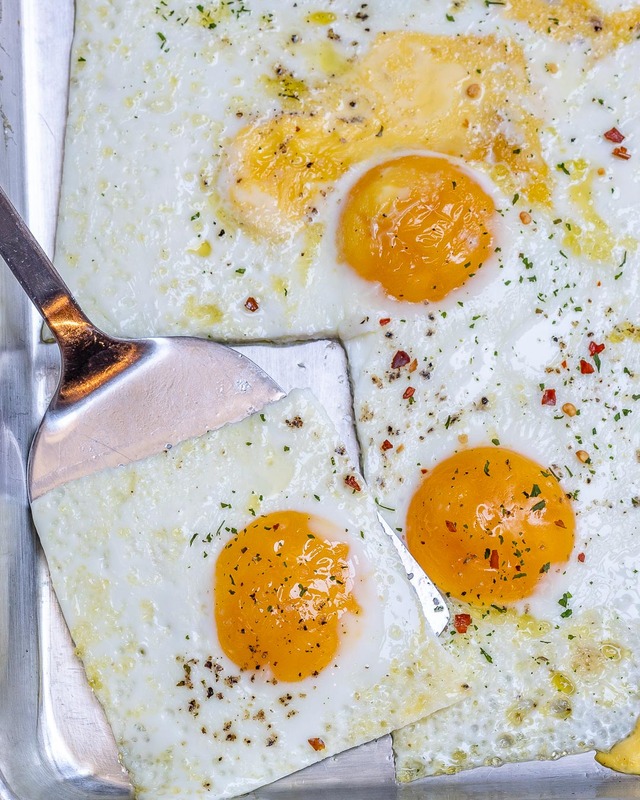 Careful not to break yolks…but its OK if a few do break. Cook in the preheated oven for 8-10 minutes. (some ovens are hotter the others so you should check them out at about 5 minutes, and depending on your egg preference, you may want to cook longer). 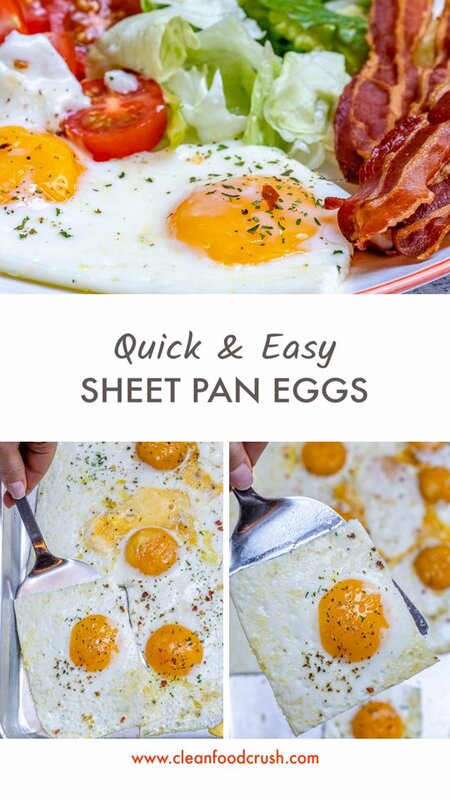 Slice eggs up as shown and enjoy immediately! 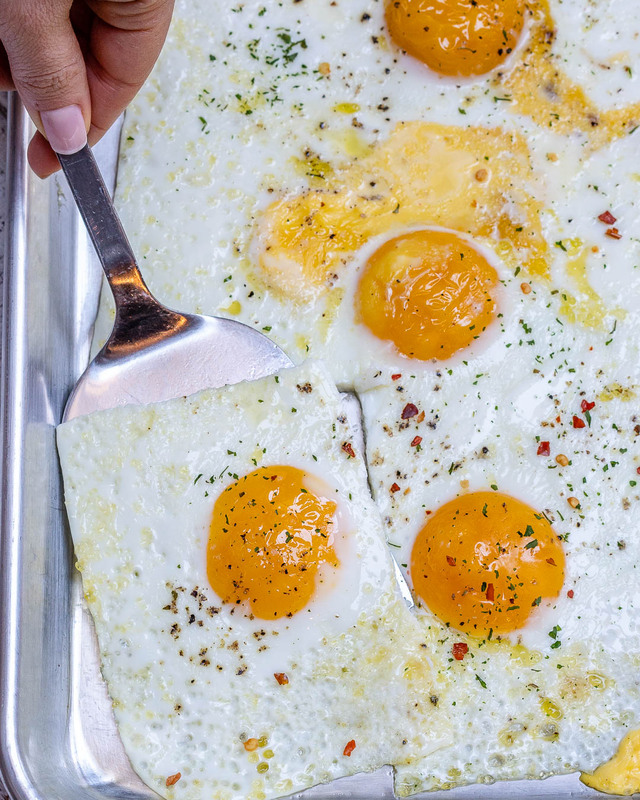 Preheat an 11x17 inch rimmed baking sheet in your oven at 425 degrees f.
Careful not to break yolks...but its OK if a few do break.